DUDLEY, Mass.—When it comes to making the atmosphere a little less serious and always putting a smile on your face, comedian Liam Meagher of Rutland, Mass., accomplishes it all. Nichols College junior and stand-up comic Liam Meagher of Rutland, Mass. Meagher is a junior at Nichols College, double majoring in marketing and history. He fell in love with classic comedy when he was younger and always wanted to peruse comedy but never knew how to start. “I remember I used to listen to stand-up comedians on the Pandora app when I was younger and have always had an interest in it,” he told Heard on The Hill this week. “Effective Speaking,” a Nichols College course that helps first-year students heighten their communication and presentation skills, was extremely beneficial to Meagher. As his love for comedy grew, so did his jokes. 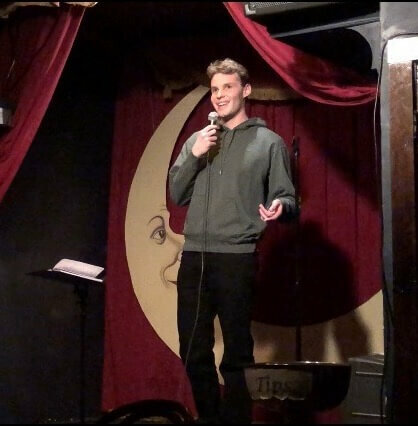 Meagher began to seriously pursue comedy at the beginning of junior year (fall 2018). Meagher didn’t let the stress of the aspects around him lessen his spirit—or his jokes. Even on the toughest day, he aims to bring smiles to the faces around him. No matter the mood, he always lightens the mood. “I like talking to new people, and I found something I ended up being comfortable doing, and that was comedy,” he said. As Meagher got more serious about his comedy, he started going on stage to perform his skits in front of small audiences at bars, and to larger crowds at restaurants in and around Worcester. Two city hot spots he’s done his stand-up routine is the legendary Nick’s Bar on Millbury Street and Beatnik’s on Park Avenue, both in Worcester. “Being on stage for me is nerve–racking every time, however there are moments where I remember why I’m up there in the first place, he said. “I always make sure I feel the crowd out before I start, because some of my jokes are a little much sometimes. “There was one time a couple months ago I was performing a set at this small restaurant in Worcester, and I was getting ready to tell one of my jokes. I scanned the crowd, and it was mostly older people, so I thought I was fine. Nope. This mother and her children came and sat right in front of me. She looked at me, wanting to know what the next joke was. I couldn’t say it in front of her, so I walked right off stage and left,” he said, chuckling about how he mainly performs at 21-plus venues. 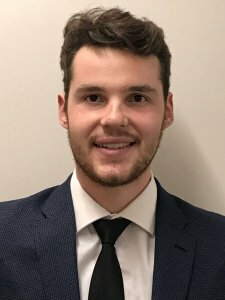 Meagher has proven to those around him that even if you have a small dream when your younger, one can still make it come to fruition later in life. 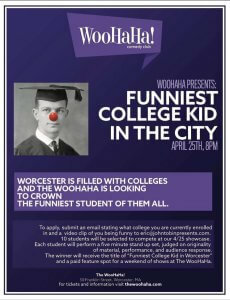 Meagher continues to perform and has recently been scouted to be in Worcester’s Funniest College Student Comedian competition, which will be held April 25 at 8 p.m. at the city’s new comedy club, Woohaha!, on Franklin Street. 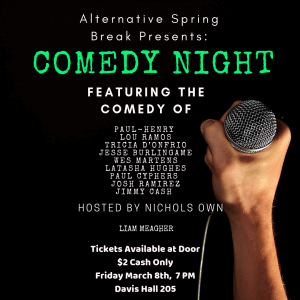 Meagher will also perform locally Friday, March 8, at 7 p.m., with nine other comedians in Davis Hall, Room 205, at Nichols College, Center Road in Dudley, Mass. Otherwise Meagher usually performs twice a week and/or on weekends in and around Worcester. Contact Liam Meagher through Facebook to know about his future events @liammeagher or on Twitter at @realLiamMeagher. Hope Rudzinski is a junior English major at Nichols College and a public relations intern for the Nichols Office of Marketing and Communications. Campus Life, Community, Events, Newsroom, Slider, Students college, comedian, comedy, comic, Liam Meagher, Nichols College, student, Worcester. permalink.